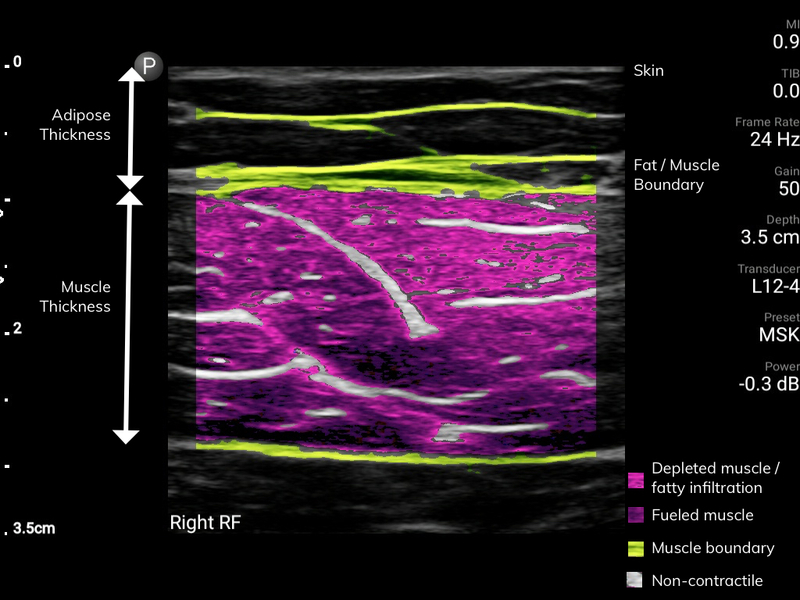 MuscleSound has the ability to perform assessments of ultrasound images. Muscle Fuel assessments will perform an analysis on the muscle region. MuscleSound will calculate the pixel intensity inside of this region while ignoring the bright (colored green) areas. Darker pixel intensities (colored dark purple) are associated with higher fuel content while brighter pixel intensities (colored pink) are associated with lower fuel content. Muscle Size assessments will calculate the distance between the center of mass of the muscle (middle of muscle vertically) and the fat/muscle boundary. That distance will be doubled and described as the Muscle Thickness. Body Composition assessments use the adipose thickness (in mm) of each of the sites.